The Taoiseach returns to Leinster House this week, following a whistle stop tour of the US west coast, writes Ailbhe Conneely of RTÉ's political staff. It is no accident he chose the tech hubs of Seattle, San Francisco and Silicon Valley for his first US trade mission; targeting multinationals with European bases in Ireland. With the Dáil in recess, Leo Varadkar grabbed some headlines. There was of course the revelation that Apple's CEO Tim Cook did not commit to proceed with plans for a data centre in Athenry, Co. Galway. 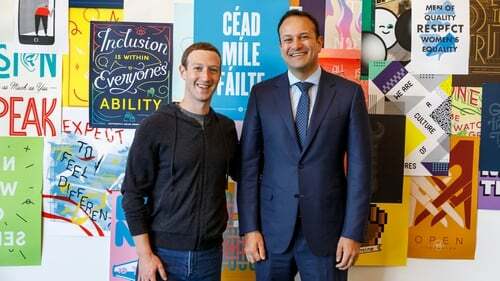 Not an ideal result for the Taoiseach after having made the trek to the Company's Californian HQ but he did have the benefit of the head of Facebook Mark Zuckerberg announcing several hundred more jobs for Dublin. A handful of Irish journalists trailed the Taoiseach to the headquarters of each tech company, all of which had their own approach in dealing with requests for WiFi codes and providing work spaces as deadlines approached. US multinationals are not shy of trying to manage their message, particularly when it comes to the media - they do not give interviews readily and handle journalists with caution. While they went out of their way to be nice and helpful, one could not help but feel like a character in the Truman Show. Among the companies visited by the Taoiseach were Microsoft, Facebook, Google, Apple and the cloud computing company Twilio, where he announced 100 jobs for Dublin. Save for Microsoft, the venues were colourful, funky with lots of varnished ply wood. We stood out like sore thumbs in suits. In Facebook, we were given a tour that ended on a nine acre rooftop park, complete with a juice bar which was blasting out tunes. Asked how relations are between locals in Menlo Park, which is the nearest town to Facebook's sprawling complex of 9,000 employees, we were told it was very positive. Everything was "positive, amazing, really open". We were escorted to a room set aside for us, to wait while Mr Varadkar got his tour of Headquarters. Three members of the communications team sat in the room watching us type. I was accompanied to the toilet, twice. That evening, there was an event at San Francisco's City Hall; a welcome break from the technical towns on the outskirts of the city. There, Mr Varadkar addressed 300 members of the Irish community, before he was presented with the key to the city by Mayor Edwin Mah Lee. In the past, according to one attendee, the presence of a Taoiseach at City Hall was so big, "Archbishops would be in attendance". Mr Varadkar had to make do with two priests. Despite the perceived lack of pomp and ceremony, the gratitude of the Irish community towards the Taoiseach for visiting the US West coast was evident. Kate Gunning, who runs San Francisco's Irish film festival, said people were "very excited" to meet him. "People in the US want to learn more about the future direction of the Government in Ireland", she said. In his speech, Mr Varadkar expressed his pride at the "important contributions" made by the Irish Community. He repeated the line, that Ireland is "an island at the centre of the world", reaching out to places far and familiar. So, will he be reaching out to the US President Donald Trump? The Taoiseach said the relationship that exists between Ireland and America is stronger than any particular administration or president of the United States. "That doesn't mean that we won't disagree and disagree publicly with the US administration on some issues. Climate change is one of those, the death penalty too, we have a constitutional ban on that in Ireland and there are issues of human rights", he said. On the final day of his visit, he said he would bring up those issues when he travels to Washington for St Patrick's Day in March. And what about a visit by President Trump to Ireland? Did the invitation still stand? "It would not be my worst nightmare. I can guarantee you there are much more serious things that could befall Ireland than the visit of any individual." While it may not be his worst nightmare, it would not exactly be a dream and some in Government buildings would view it as a problematic political balancing act.